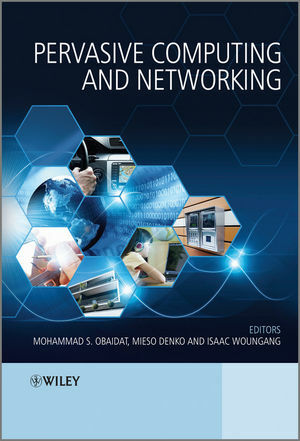 With the widespread availability of wireless and mobile networking technologies and the expected convergence of ubiquitous computing with these emerging technologies in the near future, pervasive computing and networking research and applications are among the hot topics on the agenda of researchers working on the next generation of mobile communications and networks. This book provides a comprehensive guide to selected topics, both ongoing and emerging, in pervasive computing and networking. It contains contributions from high profile researchers and is edited by leading experts in this field. The main topics covered in the book include pervasive computing and systems, pervasive networking security, and pervasive networking and communication. Pervasive Computing and Networking will be an ideal reference for practitioners and researchers working in the areas of communication networking and pervasive computing and networking. It also serves as an excellent textbook for graduate and senior undergraduate courses in computer science, computer engineering, electrical engineering, software engineering, and information engineering and science. Mohammad Obaidat received his Ph.D. and M. S. degrees in Computer Engineering with a minor in Computer Science from The Ohio State University, Columbus, Ohio, USA. Dr. Obaidat is currently a full Professor of Computer Science at Monmouth University, NJ, USA. Among his previous positions are Chair of the Department of Computer Science and Director of the Graduate Program at Monmouth University and a faculty member at the City University of New York. Mieso Denko received his MSc form the University of Wales, UK, and his PhD from the University of Natal, South Africa, both in Computer Science. Since November 2002, Dr. Denko has been with the Department of Computing and Information Science, Guelph, Ontario, Canada, where he is now an Associate Professor. Isaac Woungang received his M.Sc and Ph.D degrees all in Mathematics from Université de la Méditerranée-Aix Marseille II, Luminy, France, and Université du Sud, Toulon-Var, France, in 1990 and 1994 respectively. In 1999, he received an M.A.Sc from the INRS-Énergie, Matériaux et Télécommunications, University of Quebec, Montreal, Canada. From 1999 to 2002, he worked as a Software engineer at Nortel Networks. Since 2002, he has been with the Department of Computer Science at Ryerson University. PART TWO PERVASIVE NETWORKING SECURITY. PART THREE PERVASIVE NETWORKING AND COMMUNICATIONS. Pervasive Computing and Networking Visit the companion website to access a set of PowerPoint slides for each chapter, for instructors adopting it as a textbook.